USER SCORE:58%The percentage of users who liked this based on high quality reviews from sources such as Google Play, iTunes, and Amazon Music. Above 75% is green. ? 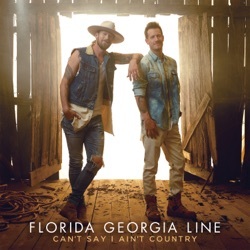 Can't Say I Ain't Country is the fourth studio album by Florida Georgia Line, released by Big Machine Label Group on February 15, 2019. It's arguably their best, but like good whiskey, songs need time to age before being distilled. The result never reaches a qualitative level that will satisfy non-casual listeners. Can’t Say I Ain’t Country—despite the effort to rewrite the narrative for themselves with the title of the record and terrible “woke” tracks—will only be another entry into the evidence file of their undeserved success. The album isn't bad, but it's not good either. Florida Georgia Line soar on their latest studio album, Can't Say I Ain't Country. Can’t Say I Ain’t Country offers little of substance lyrically and lacks the fundamental qualities of a strong pop record. Can't Say I Ain't Country is a successful blend of the cosmopolitan and country, sounding as assured on soulful slow jams and percolating crossover pop as it does on the breakneck twang of "Y'all Boys," a duet with their protégé HARDY. They’re much more comfortable with Y’all Boys’ unashamed homage to home-made alcohol, southern drawlin’, huntin’ and the inevitable “pretty girl”, but there are plenty of reasons to just say no to bro. Even though their unique music production always nudges musical boundaries, Can't Say I Ain't Country attempts to knock down musical barriers by affixing a fresh glow on past country music trends. If it’s pure Country you’re after there’s plenty to find on this record. Can’t Say I Ain’t Country mainly follows the FGL formula, one that stands on a foundation of feel-good party songs. Can’t Say I Ain’t Country might rank as one of the best Florida Georgia Line studio efforts. Florida Georgia Line protests a lot on its new “Can’t Say I Ain’t Country” album. The result is an uneven record that leaves country’s most irreverent hitmakers sounding needlessly cautious. Skits aside, most of Can’t Say is pleasant, with finely honed hooks, gleaming vocal harmonies, and lyrics that split the difference between sappy love songs and country-strong anthems. It’s easily the best album they’ve released to date, and if they’re able to replicate it in the future, haters might need to consider forgiving Florida Georgia Line for past musical offenses. ...then stop making us say it. Fake. Country. Fake. Music. Fluff Crap. We don’t buy the phony personas and constant change in costume...we just want real. Bring back music with substance or just move to pop, fellas. You Ain’t Country There... I said it. Hell no They get paid millions to make this? No thanks. Terrible How do people enjoy this noise, that’s all it is, is noise zero music here! Pots and pans make a more appealing noise. Do your self a favor and listen to Cody Jinks, Whitey Morgan and the 78’s, Adam Hood, William Clark Green, Hayes Carll, Alex Williams, Tyler Childers, Parker McCollum, Aaron Lewis, Randall King, Cody Johnson, Aaron Watson, Josh Abbot Band, The Steel Woods, Whiskey Myers, Justin Wells, Josh Morningstar, Cory Morrow, Cris Jacobs, Colter Wall, Chris Hennessee, Chris Canterbury, Caitlyn Smith, Dillon Carmichael. Just to name a few. Actually get some Substance/Feelings/Emotions from the music you listen to. People that actually put their hearts and souls into their music. Surprise your ears and soul.